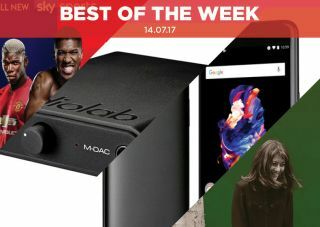 Best of the Week: Audiolab M-DAC Mini, new Rotel amps, OnePlus 5 and more | What Hi-Fi? This week Rotel expanded its 15 Series range with three more components, Sky laid out changes to its sports channels and details emerged about Spotify's trial of a Driving Mode for its mobile app. For reviews, we had a week of notable four-star efforts, with the OnePlus 5 smartphone, Audiolab M-DAC Mini and SME Model 15A turntable all put through the reviews wringer. Rotel's 15 Series range has added three new products to its ranks, including two new amps and a CD player. The RC-1572 pre-amp, RA-1572 stereo amp and RCD-1572 CD player all feature high-end DACs, as well a bespoke oversized toroidal transformer and dual differential input stages, which in laymen's terms, combine to make a better sound. All three will be available in August. Prices will be announced nearer the release date. Sky has confirmed its sports channels will undergo a major revamp this month. The changes, which kick in on 18th July, see Sky offer 10 sports channels, five of which will cover a specific sport. There will be dedicated channels for football (Premier League and Football League), cricket, golf and F1. Other sports will be shown across Sky Sports Action and Sky Sports Arena. Prices start at £18 per month for one channel, rising to £27.50 for the full complement. Details of Spotify's driving mode for use in cars have emerged, thanks to users who have been given advanced access to test the feature. The app features a more intuitive display with larger buttons. It also announces songs so the driver knows what's playing without diverting their attention. "It’s one of the more convincing packages you’ll find for the price"
The fifth OnePlus effort may be the most expensive phone it has made, but it justifies the extra cash. The camera is improved, the design slicker and the battery life excellent. Yet there are still a few lingering issues. Expandable storage and waterproofing are missing and video quality isn't much better than its predecessor, the 3T. That leaves it lagging behind other 2017 flagships, but it's a great package if you're not looking to spend a huge amount on a new phone. "For those seeking a finely balanced, spacious performance… the Mini is diminutive only in size"
Audiolab's M-DAC range added a Plus last year and now it features a Mini. Small in stature, the M-DAC Mini is intended to be portable and easy to use. There's much to like, too – the sound is spacious and well balanced with decent amounts of detail. Ultimately, we found it a little too reserved. It's a talented DAC, but lacks the expressiveness of its rivals. "In many ways this SME is one of the most impressive products we’ve had in our rooms in years"
We don't think we've tested a deck so well made. It's extremely heavy, and the assembly is a little unconventional. The performance leaves us wanting more excitement and drive though. The Model 15A is a turntable to admire, if not necessarily love.